By LUDWIG VON KOOPA - The mobile madness begins. After hearing fourteen people trying to become president talk for over three-four hours, maybe we should sit and listen to what the actual president sounds like. And I don't mean President Barack Hussein Obama, because whenever we listen to him it's pretty awful. Nah, I mean Nintendo's new president Tatsumi Kimishima. Now, we haven't heard anything from him since he became president. He's not memorable at all and hasn't done any public-facing things. Well, now he's had the "Corporate Management Policy Briefing". You can read the transcript here. We've written about this one time when Satoru Iwata did it, but since he's now no longer in that position (what an understatement), it's Kimishima's turn. And there is some relevant news. And with news, comes our ANALYSIS. Let's go! 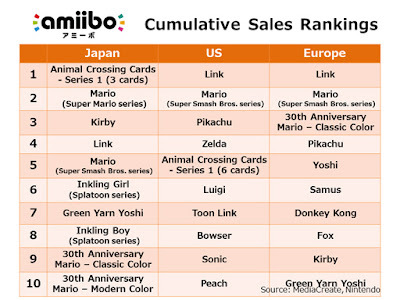 Meanwhile, Splatoon is selling amazingly, and between that, Super Mario Maker (which is also already a million-seller), and more DLC for Super Smash Bros. For Wii U and perhaps Mario Kart 8, Nintendo will try to master using already-released games to cover the fact that their holiday season is Xenoblade Chronicles X and a total disaster. The United States features King Dad's amiibo in the top 10! So starting in the fourth page we go onto the real news of the briefing. There is a "Nintendo Account" that is integrated with your Nintendo consoles, your smartphones, and/or your computer. You can log in via social media account (don't do this because if your social media account gets banned, you'll be blocked off Nintendo Account — that's what happened at Capcom Unity when I used my Facebook sign-in as my account), an e-mail, or your Nintendo Network ID. So basically, this is sort of a standard thing and I still don't know why they made a big deal out of this. The details on the actual features of account membership start on page 5 and are far more interesting. There will integrated game purchasing on "articles or videos" on Nintendo's website, like a finance website where when a company is mentioned they link to their stock ticker or something. (And presumably then day-trade that stock?) KoopaTV won't be writing those articles. 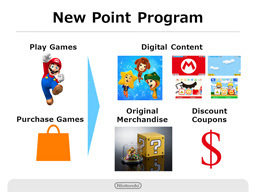 There will also be a new point program called "My Nintendo", which is the exact same name as their program back in the early-mid 2000s before Club Nintendo. Recall that the program way back then had the most value of anything Nintendo has had in America. You can get points by purchasing and registering products like before, but also by playing products. How this will be a thing is unclear and details are nonexistent, but common sense dictates that getting points that will be redeemable for things of value by playing games will be difficult. In other words, maybe registering a game gives, say, 50 points. Playing a game for, say, 10 hours would get 1 point. Or something. Look at that "Original Merchandise"... Probably gonna be a million hours of gameplay to get. 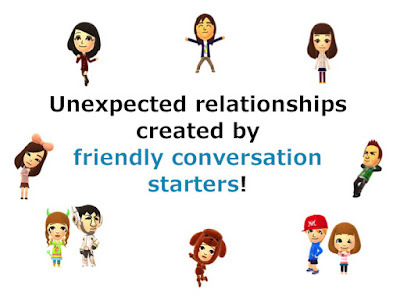 The Nintendo Accounts also have "Friend Relationships," which may be in parallel or may replace the friend lists of the Wii U and 3DS. Again, lack of details. They did say, "This Friend relationship can be used for software for dedicated game systems and for our smart device applications." ...'kay. Then there is Miitomo. 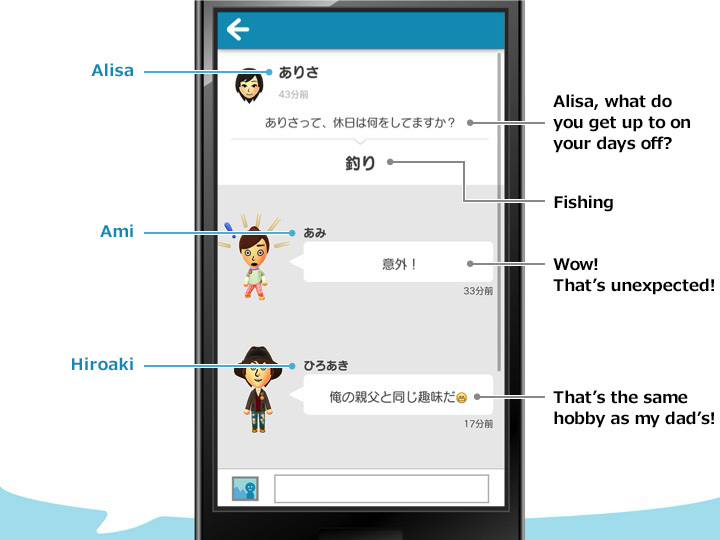 Described as "Friendly Conversation Starter", it's Nintendo's first smartphone product that's part of their initiative. One of five by March 2017, coming out March 2016. Basically it's Tomodachi Life but instead of the other Miis being NPCs, they represent the friends you have the Friend Relationships with. It's being marketed to people who have too much social anxiety to have direct conversations, so they talk through Miis instead. Your Mii will ask you questions about lesser-discussed topics, and then pass that on to someone else's Mii. Their example of that was what you like to do with your free time. Oh yeah, this is sure utilising Nintendo IP in such a compelling way. I think it's pretty obvious that many of the costumes the Miis can be wearing will be accessible only via in-app purchases (micro-transactions), or the aforementioned My Nintendo point-based program. Kimishima re-emphasised that no Nintendo IP is safe from being turned into mobile-trash. So who knows what's next. It's a pretty safe assumption that some of those Mii costumes will be based on Nintendo IP. So your Mii can wear a red hat and blue overalls for $2 or something awful like that, and you can show off to your friends (remember, friends must be mutually-selected) how much of an idiot you are for wasting money on a text-messaging avatar. Friends don't let friends waste money on micro-transactions. Well, whatever. That's the briefing. Kimishima seems to have presented it in the same style that Iwata did, at least based on the transcript. He promised somewhere else there will be a Nintendo Direct sometime between now and the end of 2015. Maybe we'll see him. Ludwig doesn't own a smartphone and is damn proud of it. Meanwhile, KoopaTV's Loyalty Rewards Program gives more reward for your time than what Nintendo's program will have. So stick to KoopaTV and you won't regret it. There was another Nintendo Direct, but no president. Kimishima gets back to us at the start of February. The actual fiscal year ended March 2016, so here's the article on that. Miitomo got to 10 million users in less than a month. Is Ludwig impressed? Ludwig evaluates how My Nintendo has been doing for his 2016 birthday. He's not impressed with THAT. "There will integrated game purchasing on 'articles or videos'" - Is there a word missing in that sentence? If not, I have no idea what it means. Even if it ends up being 1 point per 10 hours of gameplay, I won't complain about something that rewards me for playing games... although it does make me wonder if I should wait to play some of my Nintendo games until we know more, juuust in case. Miitomo sounds to me like Tomodachi Life without any of the features I liked about Tomodachi Life. But then, since my favorite thing to do in the game was create Miis of fictional characters to see how in-character or out-of-character they'd behave (I hope Blackquill and Juniper's marriage is holding up well...), maybe I wasn't using the game as they intended. Yes, the word "be" is missing. Playing games should be innately rewarding — that is, just the act of playing the game should be its own reward. This is going to have the same effect as Achievements, which is having mediocre games sell just because they offer an extrinsic reward. I think how you played Tomodachi Life is how it was intended. That said, Miitomo is all about you, not your Miis. What's wrong with additional rewards? I mean, there are crazy people who buy games JUST for achievements, and my OCD side struggled to get over not being able to complete every achievement, but what's wrong with being rewarded more for doing what you love? Right, that's why I don't think I'd like Miitomo even though I enjoyed Tomodachi Life. The problem isn't getting more bang for your buck. The problem is, you know, those crazy people who buy games just for achievements. Except developers are trying to move that from "crazy people" to "people". As long as the games are still good, I won't complain. If the games stop being fun because they're too focused on achievements, then I'll be worried. For now, I haven't seen that. You don't think doing filler tasks you wouldn't otherwise do and wouldn't otherwise count for completion (go through story mode with every character eveeer or every weapon) is crossing a line between fun and too focused on achievements for replay value? Not as long as the game itself is still fun. That's what I'm saying. I don't care about getting those achievements. If I still enjoy the game playing through it normally, I don't care if there are people out there playing it three million times to get achievements. So your position is that if other people are grinding for achievements, it doesn't affect you. Now who can be so anxious that they may have a hard time communicating through the internet and need to rely on the mercy of the Mii's RNG to communicate for them? *Looks at self* Oh right, I both nearly and actually sabotaged many of my endeavors due to my anxiety. But I am working on it and I do not need a digital character to talk for me. ...Uh... yeah, keep up the good work. This is going to be huge for them. MyNintendo will be a service that will constantly allow people to see that... Hey! You can get some free stuff for playing this mobile game, if you just go get this great new video game game console!" I don't think it's a coincidence that the first game they unveiled was one that revolved around directly communicating with friends. They want people to share their new stuff. I saw their first "game" (I really don't want to call it a game since... it doesn't look like a game) as featuring Miis because they wanted to be IP-neutral. Good point that MyNintendo will be a way for mobile trash folks to constantly get reminded that they're missing all of these potential points that they could get if they went and bought an NX with games. Buy the console and get points for that, which you then use to get the stuff. Step 1 sounds easier, and you do know they'll have micro-transaction costumes. Well this sounds... interesting. Not particularly my cup of tea, but I know sometime in the future when this Miitomo thing comes out I'll give it a go just for the heck of it. (Though knowing me, I'll probably uninstall it in a matter of seconds if its trash.) However, on the bright side, My Nintendo sounds great, and since I love to play for hours points will probably be pretty easy to get... Buuuuuuutt I doubt it. It can't be THAT easy. And if it IS easy, the stuff you'd get out of it (besides enjoyment) would be worthless. Hey, you think My Nintendo will universally turn every Nintendo game into a grindfest? I can totally see how My Nintendo would become a grindfest, especially with Splatoon. Splatoon would be the easiest game to grind actually, as many players grind it already to get higher levels. Hm, so your game grinding will also become meta-grinding.